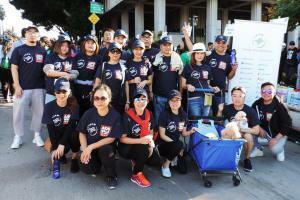 LOS ANGELES, CALIFORNIA, USA, October 23, 2018 /EINPresswire.com/ -- Member airlines of SkyTeam, the global airline alliance, participated in the recent Aids Walk Los Angeles as part of its community involvement program. Over 50 volunteers from SkyTeam’s US Market Coordinating Committee (MCC) joined thousands of other participants in Aids Walk Los Angeles which, in its 34 years, have raised more than $ 82 million from hundreds of thousands of supporters. This is part of SkyTeam’s corporate social responsibility initiative, which seeks to contribute its efforts and funds to worthy causes in the local communities in which their members operate. Last year, the alliance provided volunteers and donated funds to Habitat for Humanity Los Angeles, helping build four homes in the process. This year’s Aids Walk LA was a resounding success, as in previous years, with over 10,000 walkers joining the event, which also included entertainment by many celebrities before and after the 6 mile walk. Funds raised through Aids Walks Los Angeles provides funding to APLA Health, a community-based health center caring for historically underserved communities and those affected by HIV in Los Angeles County, as well as 20 other HIV/AIDS service organizations.